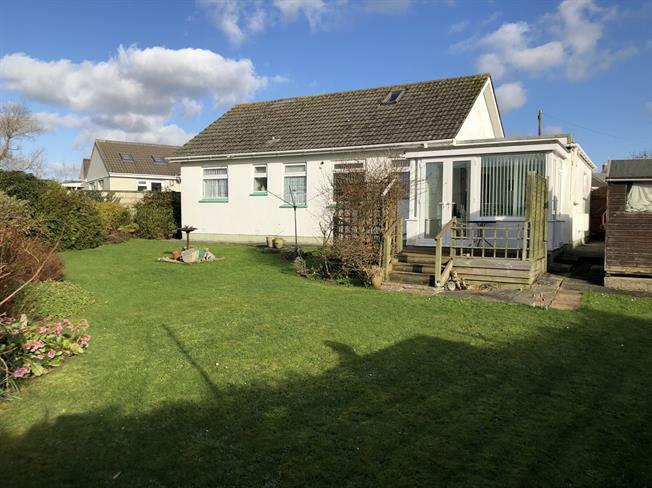 2 Bedroom Detached Bungalow For Sale in Newquay for Asking Price £260,000. This well presented two double bedroom bungalow with lounge, dining room/sun lounge extension, fitted kitchen, shower/bathroom, has gas central heating and uPVC double glazing. Outside there is an attached garage with integral door, level parking for several cars, and a deceptively spacious landscaped corner rear garden with sunny south westerly facing aspect. Viewing is strongly recommended. Radiator. Doors into bedrooms, lounge, kitchen, shower/bathroom and cupboards. UPVC double glazed window to rear. Radiator. Door into sun lounge/dining room. Modern fitted kitchen units with base units, drawers and wall cupboards. Gas central heating boiler. UPVC double glazed windows to rear and sides, with door and French doors to rear decking and garden. Radiator. Door into garage. UPVC double glazed window to front. Radiator. Built in wardrobe. UPVC double glazed window to rear. Radiator. Built in wardrobe. UPVC double glazed windows to rear. Radiator. Incorporating panelled bath, separate shower cubicle, wash hand basin and low level flush WC. The loft space is part boarded with Velux skylights. Metal up and over door. UPVC double glazed window to side. Door into sun room/dining room. There is level parking at the front of the bungalow for several cars. Foot paths lead around both sides of the bungalow to the deceptively spacious enclosed rear garden which has a warm south westerly aspect. Laid mainly to lawn with flower and shrub beds and borders.